This herb has been used for centuries to calm the nerves and induce sleep. 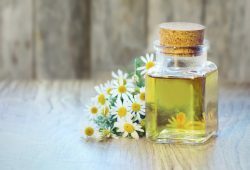 It is from a daisy-like family of plants called Asteraceae, and while there are many different types of chamomile, the most common are German Chamomile (Marticaria recutita), and Roman Chamomile (Chamaemelum nobile). Chamomile is known to be used by the ancient Egyptians, Greeks, and Romans, and was also popular throughout the middle ages. The pollen in chamomile may cause an allergic reaction if you have allergies, or are allergic to ragweed pollen. This herb may also interfere with blood thinners. Do not ingest essential oils; they are for topical use only. Consult with a doctor before using this herb when pregnant or breastfeeding.